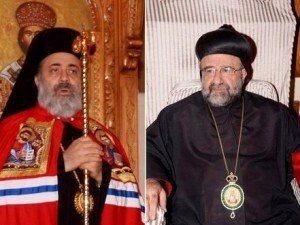 The Organization of Islamic Cooperation urged on Saturday an “unconditional” release of two bishops kidnapped this week in Syria. OIC secretary general Ekmeleddin Ihsanoglu condemned the kidnapping on Monday of Aleppo’s Greek Orthodox Bishop Boulos Yaziji and Syriac Orthodox Bishop Yohanna Ibrahim by armed men as they were en route to the northern city from the Turkish border. Christians account for around five percent of Syria’s population. They have become increasingly vulnerable to attack and abductions in the lawlessness that has engulfed much of the country since an uprising against President Bashar Assad erupted two years ago.